A majority of people on the planet speak at least two languages fluently. The needs of globalisation and cultural openness continue to underline the increasing importance of acquiring additional languages. Twynham students of French join a francophone community of over 300 million speakers worldwide and are able to access opportunities unavailable to those without foreign language skills. Beyond the proven economic advantage foreign language competence brings, research suggests multilingual brains also demonstrate increased executive function and may afford additional resistance to forms of dementia. Naturally, the joy of being able to access the culture and colour of other nations is not least among the reasons for the study of French! GCSE French has a Foundation Tier (grades 1–5) and a Higher Tier (grades 4–9). Students must take all four question papers at the same tier. Papers are taken at the end of the course in Year 11. The four skills of listening, speaking, reading and writing are each worth 25% of the exam. The exam includes 5 minutes’ reading time of the question paper before the listening stimulus is played. • 7–9 minutes (Foundation Tier) + preparation time, and10–12 minutes (Higher Tier) + preparation time. Understanding and responding to different types of written language. This course is for anyone who has already studied French in Year 9 and would like to be able to speak and understand a foreign language better. Students who speak a second (or third) language are greatly valued and sought after by employers. Many students know that most of the world’s population speak at least two languages and to compete for jobs (whatever you do!) in the future another language is a vital asset. GCSE French adds an international dimension to your choice of GCSE subjects, something both employers and higher education providers look for. 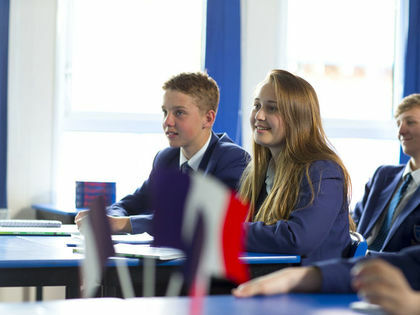 GCSE French builds on what you have learned in Key Stage 3, though you will meet new topics and learn more about the cultures and countries in which French is spoken. You will learn many skills which are useful in a wide range of future careers, such as the ability to communicate clearly, problem solve as well as creating greater opportunities to work abroad or for companies in the UK with international links. You will practise listening, speaking, reading and writing and will be helped to understand French in common situations you might meet in France or a French speaking country. You will gain independence in how to use French to communicate your own ideas clearly and accurately with good pronunciation and by the end of the course will be able to communicate effectively over a broad range of topics. Phonics, family, personalities, personal descriptions. In Year 8 students gain an ability to use tenses and extend spoken and written responses to include additional detail and opinion. The range of topics is widened and includes real life contexts relevant to students such as the use of social networks. As in Year 7, end-of-term assessments enable students to track and review their progress effectively. In Year 9, students extend their grammatical grasp of the language and command of an extending range of contexts. They begin to make lengthier spoken presentations which demonstrate a greater command of the past, present and future tenses with increased flexibility of expression.